Many new and updated products have been added to the Ion Products line, including the introduction to our Ion System Solution which gives contractors a better understanding on not just selling the Ion StormPro product, but selling a solution as well, winning customers over to lifetime partners. Our certified Ion Solution Installers are recognized on our www.ionproducts.net website. Our new Ion Gateway product allows customers to remotely monitor various aspects of their home. The Ion Gateway provides customers with advantages other monitoring systems simply cannot provide, specifically the ease of installation, price and the many monitoring capabilities offered. To purchase the Ion Gateway, visit www.metropolitanind.com/store. We recently made updates to the Ion StormPro display trailer, complete with an updated water display that showcases various pumps and control equipment. The Ion Trailer features the full Ion StormPro product line including the updated Ion Systems and latest controls like the Ion Endeavor, Ion+ and Ion Gateway. The renovations made to our Ion StormPro product line and display trailer, innovations such as our Ion Endeavor and the new capabilities the line brings allows customers to really see how the products work first hand. For more information on our new and updated products, contact one of our wholesalers or visit us at www.ionproducts.net. 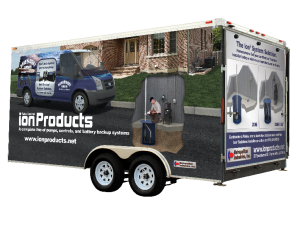 If you would like to have our mobile showroom visit your facility please contact Brian Drafke at (815) 886-9200.